Jeremy Corbyn is the leader of the UK’s Labour Party. He’s fairly left-wing, certainly by the standards of recent Labour Party leaders. He has a bunch of policies that I — as a bit of an auld lefty — broadly agree with. Yet I dislike him. Quite a bit. I’ve long rejected simple political labels. I agree with Orwell in “Politics and The English Language” when he points out that most — if not all — political labels have no universal definition. A person will say “socialist” or “democracy” and their listeners will all have completely different ideas about what’s being discussed. Worse still, this ambiguity is often used in a consciously dishonest way… deploying the words as weapons or tricks to gain advantage or influence. However, we all still have to use those words from time to time or else political conversation becomes impossible. And I do have a basic belief in broad socialist principles. Wealth redistribution, a social safety-net, universal health care, collective ownership of specific resources and services… not all; I believe market mechanisms have their place (indeed; quite a lot of places) so long as that place is well-defined and regulated in the collective interest. Importantly however, my socialism* is of the “internationalist” variety. I believe people should — insofar as is practical — be allowed seek a decent life without national borders being an obstacle. And I believe people should have the same rights and be treated equally, no matter where they are. Clearly if you compare Norway to Saudi Arabia, for example, there’s a long way to go before that ideal is even glimpsed on the horizon. But aim high, right? No, that doesn’t mean some kind of “free-for-all”. Right now, it’s practical for freedom of movement to exist within the EU. More than practical, it’s bloody marvelous. It’s also practical — and marvelous — for Europe to offer aid and shelter to refugees escaping war and disaster. None of this comes without problems to solve; occasionally even serious ones. But those problems can be solved, and the benefits (social, moral and economic) far outweigh them in any case. At the same time, yes, there are limits to global freedom of movement. Certainly over some timescales. It’s not always practical (or even feasible), especially in a world with such an uneven distribution of wealth. “Wealthy countries” sadly don’t have the infrastructure to resettle everyone who wants to leave a less wealthy country and instantly raise their standards of living. Not overnight. The solution to this — of course — is to find some mechanism to redistribute wealth more evenly from the wealthy nations to those less well-off. The EU, incidentally, is arguably one of the first major political projects to have had some success in that kind of peaceful, voluntary trans-national redistribution endeavor. Of course it’s not perfect; but it’s better than what we had before. And it can be made better still. Wouldn’t it be great to have a strong, left-wing, pro-EU Britain helping influence European policy in that direction? International socialism again, even if heavily disguised. Sorry. And I’m not saying it’s easy to raise the living standards in the most poverty-stricken parts of the world… but if you say it’s “impossible” then we’ll have to disagree. I place a little more faith in the problem-solving capacity of the human intellect than you do. And that’s fine. We can’t break the laws of physics, and our inaction on Climate Change and resource depletion will probably screw us all anyway… but there are solutions to inequality if we try hard enough. Wasn’t this supposed to be about Jeremy Corbyn? Yes. Yes it was. And yes it is. The above tweet appeared in my twitter feed. It’s the first tweet in a thread that clearly and unambiguously reveals the incoherence, contradictions and plain nonsense contained within Jeremy Corbyn’s position on Brexit, as conveyed in his speech to the Scottish Labour Party Conference (click through and read the whole thread if you like; I don’t see anything remotely controversial about it… it’s just facts). Corbyn’s Brexit plan mirrors (almost exactly) that of David Davis, Boris Johnson and Theresa May… it’s filled with “have your cake and eat it” absurdities, insistence of British exceptionalism (the right to continued influence over EU policy while standing outside the organisation and cherry-picking which rules the UK will adhere to), and easily as much ignorance about the economic, political, and legal realities of the customs union and single market as is displayed by Liam Fox on an off-day. It’s just full of nonsense. But politicians often talk nonsense. That’s not the big problem here. Cake-ism has become such a pervading attitude within the British political scene and media that we’re probably just going to have to accept it and nod politely until they decide to grow up a bit. No, the big problem with the speech — not specifically highlighted in the above thread — was that it contained an unhealthy dose of anti-immigrant rhetoric. This has become a bit of a theme in Jeremy Corbyn’s speeches and interviews since the referendum, and it is the explanation for that dislike I expressed in the first paragraph. Anyway, it’s pleasing that he no longer talks about cheap Central European workers being “imported wholesale” and “destroying conditions” for British workers. His PR-person had a word in his ear and “Central European” has become “agency” and while he still thinks of them as commodities to be “imported”, I suppose it’s an improvement that he’s no longer describing them as “wholesale”. He’s still insisting they’re driving down pay and conditions (though he’s careful not to talk about them “destroying” anything… again, the PR-person probably had a word). 1/ Corbyn thinks he has found a line on how to bash EU migrants without being seen as xenophobic. 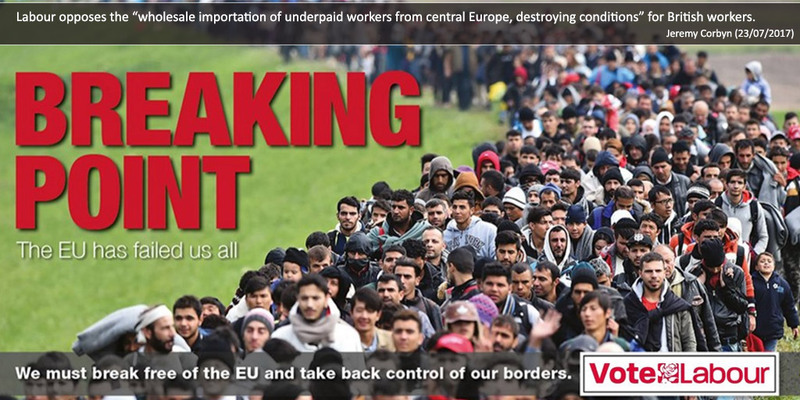 The EU Posted Workers Directive. See, if you’re the leader of a major political party and you pepper speeches and interviews with demonstrable falsehoods about the negative impact of immigrants, you don’t — in my view — get much of a benefit of the doubt. It’s just vile. It’s dog-whistle politics of the worst kind… reminiscent of something… what was it again…? And yet, there’s a veritable army of Labour supporters and Jeremy Corbyn fans who are willing to give him the benefit of the doubt. More than that; they’ll defend him to the hilt. I always find it interesting how much blind loyalty can be inspired by a politician willing to play to the unconscious prejudices of his audience**. Yesterday I got into a discussion / debate with one of those supporters. As usual, I won’t be linking or posting that person’s tweets directly here***. However I will bend over backwards not to misrepresent the position of that person. I endeavor to be fair-minded and always debate in good faith. Not saying I always succeed, but I try. Anyway, the Jeremy Corbyn supporter with whom I was debating made the following three claims in his defence (there may have been other points made; but these constitute the main thrust of the argument). Firstly, Corbyn has a long track-record of “siding with immigrants”. Secondly, the supposed anti-immigrant stuff is actually a criticism of unscrupulous bosses who exploit those workers; not of the immigrants themselves. Thirdly (and this is the one I was most intrigued by), Jeremy Corbyn doesn’t mean what he says in those speeches and interviews. He’s “not in a political position” to say what he really believes and is instead saying whatever he needs to say to get into power; even if he doesn’t mean it. That first one sounds like a defence, but is actually a damning indictment. The way I read it is this… Jeremy Corbyn has long-supported the rights of immigrants. He has been consistently on their side. Since the referendum his public statements have become at best — and this is being insanely generous — ambivalent about immigrants. From full-throated support to “wholesale importation” in the space of a day at the referendum. The wind changed. Anti-immigrant sentiment went mainstream. 52% of voters appeared to endorse a UKIP view of immigrants and as a result; just when those immigrants most needed a loud, unwavering, unambiguous defender; Jeremy Corbyn flipped and sought to fill Labour’s sails with that xenophobic wind, or at least syphon off enough of it to win a few marginals. From siding with immigrants to accusing them of destroying British workers’ conditions. Why? Because it looks like there might be some votes in xenophobia this season? Yeuch! Let’s be clear; this isn’t some minor politician altering their position on a local school closure because they realise it gains them some votes (as lacking in integrity as that doubtlessly is). This is the leader of the opposition (and — according to a recent poll — the likely next Prime Minister) of the UK suddenly switching from “siding with immigrants” to launching public attacks on them at the precise moment they’re at their most vulnerable. Right now in the UK, there is an apparent spike in the number of people being threatened, intimidated, and sometimes physically assaulted because of their nationality or race. And when you see the video posted by a black student, justifiably scared by the vicious arseholes chanting “We hate the blacks! We are the black-haters!” outside her door… and then hear them chanting “Brexit! Brexit! Sign The Brexit Papers!” you realise what an ugly can of worms has been opened by that referendum. These vile people have — unquestionably — been emboldened by the vote. That’s not a suggestion that the 17.3 million British people (52% of those who voted) who triggered Brexit are all “the black haters”. It’s just pointing out that one of the consequences of their decision has been to provide a terrible faux-legitimacy to awful people and their hatred. And yes, I think if you chant “We hate the blacks” it’s not hyperbole to describe it as “hate speech”. Let’s also be clear… I’m not for a moment saying or implying that Jeremy Corbyn feels anything but disgust at the behaviour of those people. I feel 100% certain that he does. Those people don’t represent him, and he doesn’t represent them. And if someone suggests that; they’re a goddamn moron. But every time a prominent politician gives a speech or an interview and whispers into the ear of the British public that immigrants are lowering their wages and destroying their working conditions…? It makes the people who chant racist slurs feel a little bit more comfortable; a little bit more legitimate; a little bit more like they have the backing of those in power. Jeremy Corbyn has stated that his problem isn’t with immigrants per se, but with the dodgy bosses and employment agencies who do the “wholesale importation”. Immigrants are very possibly decent people exploited by an immigration system that’s destroying the conditions of the British worker. The person I was debating with posted two separate instances of Corbyn making that very point. And yes, he says that. But he doesn’t just say that, does he? Make no mistake; if that really was Corbyn’s concern, then the answer is to only talk about the unscrupulous bosses and agencies while at the same time maintaining the supposed track-record of always siding with immigrants. The answer is to come up with stronger regulation of the unscrupulous behaviour; to devise policies that raise the pay and conditions of British and immigrant workers; to regularly stress the benefits of immigration during this time when those people most need a strong voice in their corner. To work with the EU to protect the rights of workers, whatever their nationality. But apparently he’s not in “a political position” to side with immigrants right now… it’s more important he sway some UKIP voters into his camp. Even if “the black haters” do feel a bit more confident in their hatred as a result. If you abandon the vulnerable because you think it’ll win you votes; then I hope to hell you don’t get a single one. Whoever you are. If it’s really about the unscrupulous agencies, then modify your damn language Mr. Corbyn! 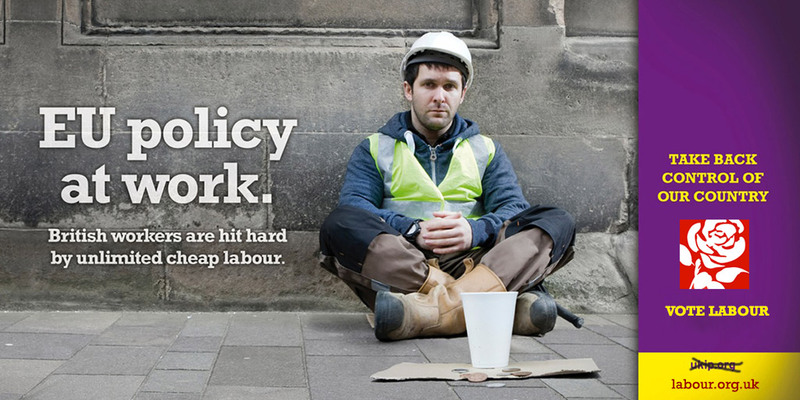 Don’t talk about “the low-paid immigrants destroying conditions”. Not ever. Support the low-paid whoever they are. Whether born in London, Leeds, Liepāja or Ljubljana. And demand better workplace regulation and higher pay for everyone. Leave out the scapegoating and the xenophobic dog-whistles. Stop making the racists feel at home. They shouldn’t be welcome in the Labour tent… however many votes they offer. You’re supposed to represent the people who elect you, Mr. Corbyn. So why do you want the votes of the anti-immigrant crowd? The end justify the means? Which segues nicely into the final — and most depressing — defence of Jeremy Corbyn. He doesn’t mean what he says. He’s just saying whatever the hell he thinks will get him elected. Really? That’s the big, ringing endorsement is it? Christ… how far the idealistic have fallen, eh? I remember a time when a politician telling lies to trick people into voting for them under false pretences was a solid reason not to vote for them. For Corbyn supporters it’s the opposite… it shows how great he is. Guess what, Jeremy Corbyn fans, it doesn’t show how great he is. It shows the complete opposite. Remember when Corbyn’s big attraction was his integrity? “You may not agree with everything he says, but at least you know where he stands”. He placed honesty above spin, didn’t he? Well, that’s how Corbyn fans sold him to us first time around. Why has the sales pitch suddenly switched to “You may not know where he stands, but at least he’ll say whatever gets him power”? I understand your desperation, I really do. But I’m not a big fan of the lies and hypocrisy. And that’s some really deep hypocrisy you’ve chosen to wade through on your way to power. I’ve never been the world’s most vocal proponent of representative democracy. But most of Corbyn’s supporters would be solidly democratic. Yet they are happy to support a leader who’ll subvert it in the name of power. Because tricking people to vote for you — by telling them what they want to hear, not what you truly believe — is a blatant subversion of democracy. When Albert Einstein wrote, in his essay, Why Socialism? he was specifically attacking the tendency of private capital to control “the main sources of information”. Nonetheless, having read the entire published output of the man, I will confidently claim he would have put lying politicians in the same bracket when it comes to undermining democratic principles. If people don’t know what they are voting for; if they’ve been misled by lies and propaganda… trickery to con them out of voting for what they actually believe in… then it’s proto-tyranny, not democracy. And no, “but everybody does it” does not make it any better. This was not an argument made by my twitter interlocutor, but it’s one I’m willing to make on their behalf… is it not a good thing that xenophobes and borderline (even not so borderline) racists are fooled into voting for a less extreme party? Does it really matter if those people are deprived, through propaganda and disinformation, of their ability to arrive at “objective conclusions”? In short, shouldn’t we treat them with the contempt they deserve and try and undermine their democratic rights? Well, obviously not if you believe those rights are important or universal (the ethical argument). And definitely not (the practical argument) if you want to reduce the extremism, hatred, fear and anger of those people. Yeah, a lot of them are morons. But even morons eventually work out they’ve been conned. And guess what? That doesn’t actually make them any less extreme. Quite the opposite in fact. I’m not telling anyone to treat “the black haters” as reasonable people… but I would urge us all to try and not make them any more unreasonable than they already are. Courting the votes of xenophobes, pretending to be sympathetic to their position, and then betraying their trust after you get their vote…? Well, it’s better than courting the votes of xenophobes, pretending to be sympathetic to their position, and then not betraying their trust after you get their vote. But you know what’s better than both? 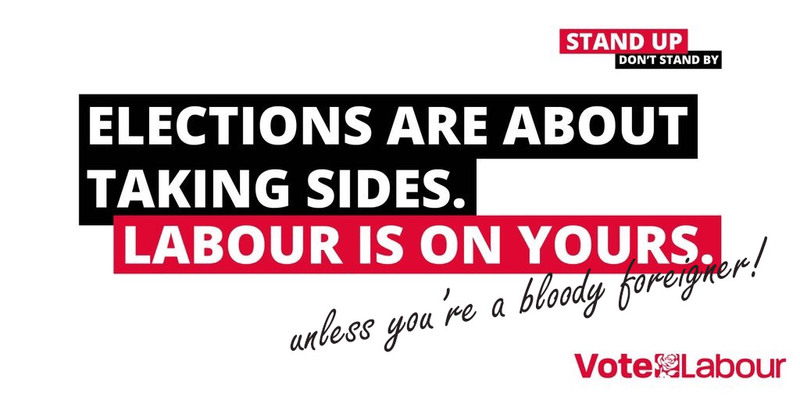 That’s right Jeremy… not courting the votes of xenophobes in the first place. Not telling lies about foreigners destroying the jobs of decent British people. Not making racists feel better about themselves. Except… well, who’s really being fooled? I’m not at all sure my Corbyn-supporting sparring-partner on twitter really got this point. But if Jeremy Corbyn gives an interview accusing “imported immigrants” of destroying British workers conditions on a Monday; then on Tuesday gives a speech about unscrupulous bosses doing the real damage; what makes you assume the former is just a vote-grabbing tactic while the latter is his real position? Why can’t it be the opposite? Were people sent a Corbyn-decoder-ring with their Labour lapel-pin when they joined the party? Does he give a secret signal to let his supporters know “this one’s the lie”? Is it dependent on what colour suit he’s wearing? The time of day of the interview? How exactly am I supposed to know that this is a compassionate, internationalist strategically courting xenophobic votes? And not a secret xenophobe strategically courting the liberals? Firstly — and to return to a previous point — his track-record of siding with immigrants. Except… well, when you abandon a vulnerable group in their hour of greatest need, then maybe your support for them was never all that sincere in the first place? Leaving us with the second answer… “as a Jeremy Corbyn supporter, when he says something I agree with, then he’s telling the truth. If I disagree with something he says, then obviously he’s just saying it to trick people into voting for him”. I’m guessing the Corbyn-decoder-ring is really a state of mind… two parts desperation to three parts blind faith.